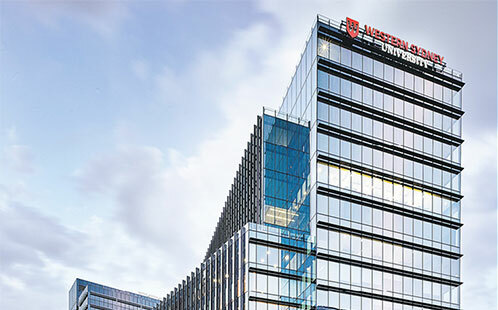 The University's flagship Parramatta City campus, located at 169 Macquarie Street, is a $220.5 million commercial development consisting of a 14-storey, 26,500m², A-grade building as part of the Parramatta Square precinct and redevelopment. The building spearheaded one of Australia's biggest urban renewal projects and supports the transition of Parramatta into a true university city. The Parramatta City campus, owned by two of Charter Hall's managed funds, was developed by Charter Hall and constructed by John Holland. Western Sydney University has committed to a 15-year lease of the building. Parramatta Square is set to be a lively, cosmopolitan area with future development plans including residential apartments, a 150-room hotel, retail and office spaces, civic building, community centre and public library. In the heart of Parramatta CBD, bound by Church, Macquarie, Smith and Darcy Streets, Parramatta Square is an ideal location for the University's new campus. The Parramatta City campus will enhance our students' learning experiences, providing close links to industry, community and government. Students and staff will be able to access public transport easily, as the Parramatta Transport Interchange, connecting rail and bus networks to the Sydney CBD and beyond, is less than 100 metres from campus' doorstep. It will also provide students with links to facilities and enable community access to Western Sydney University and our educational, research and consulting services. If you are concerned about your safety on campus at any time, contact Campus Safety & Security on 1300737003, 9685 8111 or use the red emergency contact point button on every level near the lifts. The University's free shuttle bus service connects Parramatta City campus (Macquarie Street entry bus stop) with Parramatta South and Parramatta North campus. For more information visit the Shuttle Bus website (opens in a new window) or use the Shuttle Tracker. (opens in a new window) Find out more about your travel options on the Getting to Uni webpage, and download the Parramatta City campus map [PDF, 800Kb] (opens in a new window).